Mother and daughter having a great time at the tea party. I love attending baby showers! To me, it’s about celebrating the upcoming arrival of a new baby, playing silly games and having cake. Actually, ANY excuse to have cake. The older I get the more invites I receive to these baby showers. It seems like every other weekend I’m measuring how many toilet paper squares it will take to wrap around a pregnant belly or trying to guess what melted chocolate bar is on a diaper or trying to win the most safety pins for not saying “baby” or crossing my legs. XBOX is helping me get my EX-ercise on! I've promised myself that I'm going to eat better, exercise more and just treat myself with better care therefore I'm always looking for new ways to get my "fitness on" so when XBOX invited me to try out their new "Project Natal" I couldn't say no. This new video game allows you to use your body as the controller which means you get to move...a lot! I got the chance to try out their new video game "Ricochet". The object of the game is to hit a ball back and forth against a wall with whatever body part you can. You can use your hands, feet, hips, basically anything goes. I played it for about 5 min and I was already sweating! Burning calories AND playing video games is definitely a great combination. I will post a video which I shot with my handy new Flip-cam, provided by XBOX, so check back to see all the action. All that moving made me hungry so I was happy to sample all their yummy appetizers. I loved their miniature burgers, grilled cheese and reuben sandwiches. Small portions equal smaller calories which is just the right amount for me (although, by the look on my daughter's face she doesn't seem to agree). I was glad XBOX made it a family-friendly event which allowed me to bring my husband and daughter along. She loved watching all the people in action and she would play along side them as they kicked and punched at the screen. Fellow mom blogger Eunice's son Harry testing out the new Project Natal. I think one of the event's highlights for my daughter may have been Tyler, balloon artist extraordinnaire! (Being that she's only 19 months old and can't fully comprehend video games yet). I thought I was stretching it by requesting an Elmo but that was nothin'. This guy made a frog, a bee, a ninja turtle, a bear riding a unicorn AND Hello Kitty!!! Kudos to XBOX for bringing Tyler. He was like the pied piper, everywhere he went a mob of balloon-seeking kids followed. I know some of you are probably wondering when you can take part in the XBOX Project Natal experience. This new video game will be released prior to the holidays which means it will make for a perfect gift of fun and fitness. I know it's going on "my" list to Santa... yes, I still believe in Santa. Thank you XBOX for allowing me and my family to be one of the first to experience Project Natal! Looking forward to owning it in the near future. Blogger Brunch by the Bay!!! I recently attended a "Blogger Brunch" thrown by Child's Play Communications at the beautiful Shade Hotel in Manhattan Beach. Southern California-based mom bloggers enjoyed a delicious brunch where there was an omlette bar, bubbly champagne and mimosas to celebrate the occasion. After our meal, we were able to learn about some terrific new products for the whole family. We received great giveaways and even won some amazing raffle prizes. Here's a rundown of some of the great products that was there. 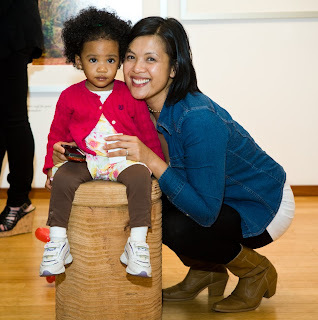 I started off at the Pottery Barn Kids table where they displayed their new summer-inspired line for kids and teens. There were some beautiful quilts (which I wasn't lucky enough to snag) and I was lucky enough to receive a cool beach bag and a pink hooded towel for my little girl. It's going to come in very handy with all the swimming she'll be doing this summer. Bandai had a whole variety of toys on display including Harumika styling dolls, Ben 10 action figures and my favorite, the Choco Pot! I wish this thing was invented when I was a kid. (Maybe I'd be the next Rachael Ray by now.) Are you kidding?! My own little chocolate melting pot?! I never would've left the house and they would've had to pry it out of my hands. Melted chocolate, every kids dream come true...or maybe just mine. Since I personally drive one, I was happy to see Toyota there with info on their new 2011 Sienna. This new vehicle seats 7 passengers with wider and longer interiors without increasing the exterior dimensions. I love my 1999 Toyota Corolla but if they wanted me to take the Sienna for a trial run I'm sure I could find 6 passengers to help me test it out. Vegas anyone?! My daughter LOVES her some Nick Jr. in fact she could spot Moose A. Moose's voice from a mile away. I was happy to see their parent company,Nickelodeon with the newest line-up of Dora the Explorer dolls, play sets, games and more. I also learned they recently launched their "Beyond the Backpack" campaign which provides tools to helps preschoolers be well-prepared for their first school experience. The site will have activities that help engage children in critical areas related to school success such as: social skills, early literacy, math ability and health and wellness basics. I will be checking this site in the near future since my little girl will be embarking upon pre-school soon. Ahh, where does the time go??? Backyard Safari Outfitters is every nature-loving kids dream come true!!! These toys give children an opportunity to get up close and personal while scoping out "wildlife" from insects in the grass to birds in the sky. I was lucky enough to score one of their mini lanterns and a dual power flashlight which are both going straight into my earthquake preparedness kit. Even though I am trying to stay away from sweets, I couldn't resist trying Cold Stone Creamery's new Oreo Ice-Cream Sandwich. I was so engrossed in the experience I forgot to take a photo. It was the perfect end to a delicious meal and every calorie was worth it!!! Wait, calories don't count during events...right??? Eunice get a cosmetic touch-up as I enjoyed my treat. Temptress Cosmetics was there doing mini-makeovers for some of the moms. My make-up artist recommended trying a new color, red! I begrudgingly agreed but in the end I think it was a fun alternative to my bland clear chapstick. Pajama Jeans! I recently received mine in the mail and when I put them on my husband said, "Nice jeans" and I responded with much enthusiasm, "You would THINK they were jeans but they're pajamas! There's not even a zipper. It's an optical illusion!" I LOVE these because like other moms, I am guilty of leaving the house in my workout clothes even when I'm not working out. Now I can wear my pajama jeans with pride while shopping at the mall or playing in the park. GENIUS Pajama Jeans GENIUS (bowing down)! 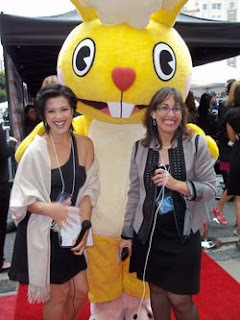 Thanks again to Child's Play Communications for allowing me to be part of such an amazing event! Cinderella for a day at the Streamy Awards!!! I was invited by Kodak to come and interview celebrities on the red carpet at the Streamy Awards and after the initial excitement I started to panic. I figured I'd need a dress (which I did't have), hair and make-up (which was going to cost an arm and a leg) and a babysitter (which is hard to come by). It's amazing how the universe always comes together to answer my prayers. I mentioned it to a girlfriend and she lent me an amazing Armani dress, my friend Kris (who is a model/comedian/make-up artist extraordinnaire) agreed to do my hair and make-up (and did a phenomenal job!) and my husband insisted that he'd watch my daughter so I could enjoy the event. Thank you fairy-godmother, Cinderella is going to the ball!!! The Streamys, which took place at the Orpheum Theater, honored web-based television and since I was sent there by Kodak I figured I could ask the nominees and presenters what their favorite Kodak moment was. Interviewing is definitely not an easy job (much respect to you Ryan Seacrest) so I was glad to have fellow LA mom blogger Donna there to shoot and co-interview by my side. 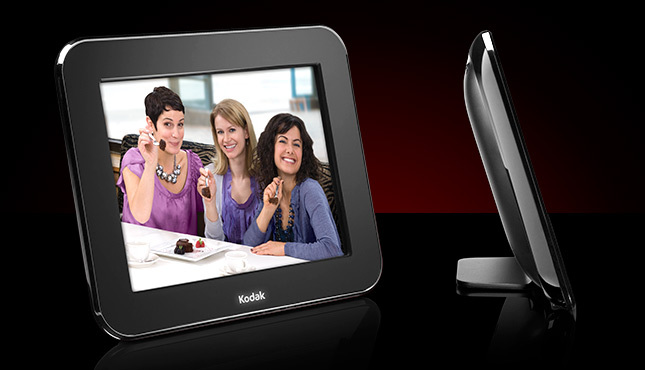 We recorded our interviews with Kodak's newest pocket Zi8 camcorder. Coincidentally, many of the video directors told us they the same camera for their projects too. All the people I interviewed seemed to enjoy sharing their answers. I figured all the other questions were about their shows or the routine, "How does it feel to be nominated?" type questions so ours was refreshing. One actor even said, "THAT is the BEST question I've been asked all night!" The responses ranged from the birth of my daughter, the day I brought my dog home from the pound, receiving G.I. Joes on Christmas morning and running around the park in depends! They were definitely informative and insightful answers. There were many celebrities who attended: Illeana Douglas, Patrick Duffy, Jaleel White, Tony Hall, Tatyana Ali, Robert Englund, Justine Bateman and Kevin Pollock just to name a few. I felt like it was a very relaxed environment and all the staffers for the Streamys, Kodak and Ketchum couldn't have been nicer. They gave me and Donna a lot of freedom to talk to everyone at the event. I think the highlight of the day was interviewing Patrick Duffy. Yes, "Man of Atlantis", "Dallas" and for the younger generation "Step by Step" Patrick Duffy. I couldn't believe he was right in front of me. I remember watching him on that show thinking Suzanne Sommers is one lucky lady! Can you TELL how giddy I was by the smile on my face?! I especially enjoyed interviewing the up and coming web actors. They were humble and genuinely excited to be there. A lot of times I think when an actor becomes a huge celebrity they lose the graciousness of doing interviews and greeting their fans. I have a feeling many of these web actors will become household names in the near future so I feel privileged to have met them at this red carpet. After a 9 hour day I was happy to end the night by saying a quick good-bye to the awesome Kodak and Ketchum crew at the Cicada after party. I was also excited to take a red-carpet photo with my partner in crime, Donna, but at the end of the day all I could think of was my husband and daughter. Did they have a good day? What did they eat? I wonder if I could get home early enough to see them before bedtime? When I got home I took off the beautiful Armani dress and snazzy red shoes wiped off all my make-up and washed all the product out of my hair and happily slipped into something more "mommy". I was disappointed to find my husband and daughter already asleep because I wanted them to see me all “fancified” but I guess that's what pictures are for. On the kitchen counter I found a pepperoni pizza and in the refrigerator a diet cherry coke zero. Ahhh, just what Cinderella ordered. DISCLOSURE: I was not compensated to write this post. I received press credentials to attend the Streamys as a guest of Kodak, who is a major sponsor of the show. I did receive a Zi8 camcorder to use on the red carpet, as well as a small digital camera and digital frame...BOTH OF WHICH I'm giving away, click on this link to find out more details and enter the contest. 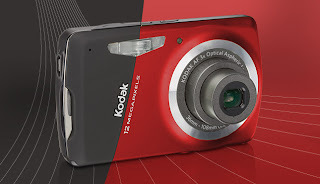 WIN Kodak's New M530 digital camera or Pulse digital frame!!! M530 Digital Camera OR Pulse Digital Frame! 2. Make sure I can access your blogger profile so that I can contact you if you win. I will run the contest until midnite of May 9, 2010 and ONE reader will win the M530 digital camera and another will win the Pulse digital frame. The TWO winners will be chosen by using random.org and will be announced on May 11th, 2010! Please follow my blog so you can learn about future giveaways. THEN I put 1 thru 29 in the number randomizer (because that's how many entries there were) and whatever number came up was "matched" to the first list. And the winning number was lucky number 13!!! Which is...drum roll please...AMY ANDERSON!!! Congratulations Amy! Please email me your address so I can have the card sent to you. Thank you everyone for all your comments! The next giveaway gives you TWO chances to win! The two gadgets are courtesy of Kodak. One is their awesome NEW M530 Digital Camera and the other is Kodak's Pulse Digital Frame! Check back in a few days for details and thanks for reading my blog! It's no secret that I'm a huge fan of Fresh and Easy. But now I'm an even bigger fan because they're coming out with their EatWell healthy meal options that are fresh, convenient and best of all they're DEE-licous!!! Each meal contains 25% or less of your daily caloric intake, which means, you can have four of these meals and still be within the daily guidelines based on a 2,000 calorie diet. Each individual packaging clearly displays the calorie, fat, saturated fat and the sodium content, which is very important when you're trying to lose weight. The EatWell launch consists of 17 new items including Fresh Ready Meals, Soups, Salads, Sandwiches and Sushi-all made in the Fresh & Easy kitchen. I was lucky enough to sample a number of these products at Fresh & Easy's home office and I must say that I agree with their motto, "no compromise on taste". All the dishes were fresh, flavorful and I didn't feel like I was missing anything when I ate them. My husband and I have taken an oath to eat better in our daily life and these convenient, healthy and reasonably-priced meals will definitely help us accomplish that. I know you're probably wondering, "How you can I get my hands on these new EatWell meals?" Starting April 7, 2010 they will have these products, and many more, available at your local Fresh & Easy grocery stores so you can experience the goodness for yourself! The Awesome Fresh & Easy Team! Thank you Fresh & Easy for allowing me to be part of such an awesome event!! !